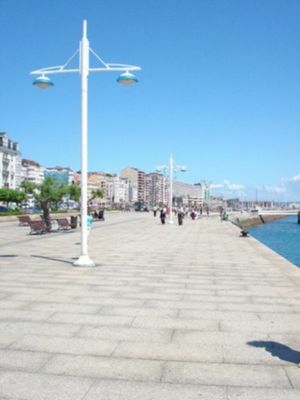 Santander  is the capital and also the largest city of the province of Cantabria in Spain. Santander has some 180,000 inhabitants and is on the ocean. It features a small historic center and a handful of beaches. Its most famous tourist attraction is the Magdalena Palace which was used as a summer getaway of Spanish royalty. Santander - Parayas, Aeropuerto Internacional de Santander  (Aptdo de Correos 097, tel. 942 202100, fax 942 202152, email: [email protected]) is located in the municipality of Camargo, 5 km East of Santander (mostly domestic and charter flights; international flights from London, Edinburgh, Dublin, Brussels, Dusseldorf, Berlin, Rome, Milan, Venice, Warsaw, Budapest and Marrakech). Ryanair  flies from London Stansted, Rome Ciampino, Edinburgh, Dublin, Brussels Charleroi, Dusseldorf Weeze, Berlin Schoenefeld, Milan Bergamo, Budapest, Marrakech, Barcelona, Malaga, Valencia, Tenerife directly to Santander Airport. Iberia  offers daily flights to Santander from Madrid, Lisboa and Gran Canaria. Vueling  flies from Barcelona, Alicante, Tenerife and Palma de Mallorca, to Santander. Volotea  flies from Venice, Ibiza, Menorca and Palma de Mallorca to Santander. Wizz Air  flies from Warsaw Chopin to Santander. Flights to Santander are really cheap. Another option could be to fly to Bilbao and taking a bus (ALSA) from Bilbao to Santander. Taxis from the airport to Santander are about €20. The taxi stand is in front of the terminal building. You can also hire a taxi with English speaking driver at the following tel. +34692240616 or by e-mail [email protected] , you can ask for the price of your trip (airport to the centre for €15) and make reservations. Credit cards are accepted. The Alsa  city bus (tel 942211995) to Santander Bus Station (Estación de autobuses) departs daily at 6:30 and 6:50 AM and then every 30 minutes from 7:15 AM until 10:45 PM from directly outside the arrivals terminal (€2.9, December 2017). Duration of the journey: 10 minutes. Santander Airport has direct access to the motorway A8 Santander - Bilbao. ALSA  operates daily bus services to Santander from Galicia, Asturias, Pais Vasco, Extremadura, Castilla y León, Zaragoza, and Barcelona; and weekly services from Belgium, France, Switzerland, and the United Kingdom. The trip from Madrid takes about 5 hours (about €30) and the trip from Barcelona takes about 9 hours (via Zaragoza). There are about 20 buses per day from Bilbao to Santander, journey time about 90 minutes. Single ticket €6.60 (March 2014), return €12.75 (December 2009). On the tickets it says the number where you sit in the bus ("asiento"). The numbers are on the windows in some buses. Bilman Bus  offers daily bus services from Valencia, Alicante, Cartagena, and Murcia. Flixbus  Low cost bus company, operates lines from different cities to Santander. For more information see the Santander Bus Station (estación de Autobuses de Santander)  with timetables from and to all destinations available. RENFE  operates daily trains from Madrid and Alicante to Santander with stops in the main cities on the way (Palencia, Valladolid, Segovia, Cuenca and Albacete). Trains leave from Madrid Chamartin Station at 7:40 AM Mon to Fri, 1:30 PM, and 6:05 PM daily. The trip from Madrid takes about 4 hours (~€35). Feve  offers daily train services from Bilbao and Asturias to Santander . You may also wish to take a ferry from Plymouth, England. The journey time is approximately 24 hours each way, and is an interesting journey, although you may wish to resist having a large meal too soon after departure from Plymouth if you are unused to sea travel as the Cantabrian Sea can be extremely rough. Britanny Ferries  operates two sailings a week from the UK to Santander from mid-March to October, on Wednesdays from Portsmouth and on Sundays from Plymouth, average sailing time hours. operated by the modern MV Pont Aven . From November until around December 20th and from Mid-February until March only the Plymouth - Santander service is operated with MS Bretagne , journey time 24 hrs. There is no service from around December 20th until mid-February. Santander is 150 ml (246 km) from Biarritz, 272 ml (437 km) from Bordeaux, 327 ml (537 km) from Toulouse, 583 ml (937 km) from Marseille and 685 ml (1103 km) from Nice. Santander is 517 ml (832 km) from Alicante, 443 ml (709 km) from Barcelona, 173 ml (279 km) from Leon, 243 ml (399 km) from Madrid, 630 ml (1014 km) from Marbella, 226 ml (364 km) from Salamanca, 474 ml (763 km) from Santiago de Compostela, 155 ml (250 km) from Valladolid, 314 ml (505 km) from Vigo and 249 ml (401 km) from Zaragoza. Santander is 517 ml (848 km) from Lisboa and 405 ml (648 km) from Porto. Foot Santander is reasonably small. The distance from one end of town to the other are some 6km (4 miles) and can be walked in 2 hours along the coast road. Within the city center everything is within walking distance (15min walking). Bus Public buses are available at reasonable prices. Each journey costs € 1.30 (May 2018). It costs more for journeys out of the city proper, or you can save 40% by buying a 10-journey gray-colored 'Bonobus' card at a 'Tabaco' shop. Each time you get into bus you shall put the card onto the reader which books the travel price. A 10 journey Bonobus ticket costs € 6 (December 2009). Specifically, buses can take you to the main beaches some 2-4km (2m) from the city center. Timetables and map for download: . In each bus-stop there is a timetable and route of all city buses. Ayuntamiento is the city-center (close to the regional bus stop Plaza Estaciones and railway-station). From there to the Plaza de Italia, near to the beach Sardinero there are 10 bus-stops, so don't take this route on foot. Buses run quite frequently and an easy transportation. Hop On Hop Off Bus , tel 800-750-2859 departs from the Cathdral daily at 10.45 and 11.25 am, 12.00 noon, 1.15, 1.55, 4.45, 5.20, 6.00 and 6.35 pm, with stops at Pasea Pereda, Museo Maritimo, Palacio de Festivales y Planetario, Palacio de la Magdalena, Casiono/Playa de Sardinero, Faro de Cabo Mayor, Matalenas/Campo de Golf. Estadio, Universidad, Avenida Valdecilla, Cuatro Caminos and Barrio Pesquero, the entire journey taking about 75 min. Internet rates: for 24 hours $21,95 per adult, $10.95 per child (5 to 15), for 48 hours $24,95 per adult, $11.95 per child (5 to 15) plus $3.95 "processing fee" per order. No refunds! Children under 5: free of charge. Explanations given in Spanish, English, French, German, Italian, Dutch and Japanese plus a commentary for kids. Taxi Taxis are widely available throughout the city. Bicycle The city offers bicycle rental, for a very low price, at a number of locations around Santander (Jardines de Pereda, El Sardinero, La Magdalena). Bikes are loaned for the day, so get in early to avoid missing out. 5 city walks: go to the Santander Tourist Office in the city center (Old Market, near the Old Banco de Santander) and get a free city guide; the free city guide describes these 5 itineraries. These 5 itineraries are enough to keep you busy for 1-2 days. 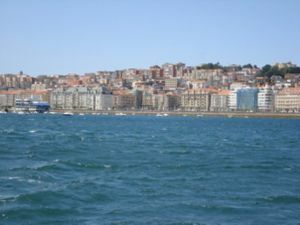 boat round trip: There is a regular boat service through the Santander Bay, boats run from Santander to Pedreña, Somo and back. For a 45-minutes round-trip you have to pay €3,90 and the boats depart at least every hour. Enjoy the beaches. Walk up to the lighthouse at Cabo Mayor, visit the museum and enjoy the view from the top. Other things to consider: Santander is a city in North Spain and weather is similar to North Germany. At 4-6 September 2013 it has rained, so even if you go there in summer, please take an umbrella or rain coat. It can rain any time. It is a windy place and there can be fog in the morning. Evenings tobacco shops might be closed so if you smoke, please try o buy cigarettes in the day or keep some coins, in some bars there are cigarette automatons (4,90 Euros for Marlboro Light - September 2013). A lot of old age pensioners are around and people have a high-living standard, so food in some restaurants and other daily needs might be expensive. Please beware that unfortunately there are not so many people who can speak English, therefore it is advised to learn some basic words how to order something in restaurants etc. Santander has a lot of fine beaches . Lighthouse at Cabo Mayor (faro de Cabo Mayor), and the devil's bridge (puente del diablo), a bizarre rock formation. Playa de Bikinis, safe and lovely beach on the Peninsula de la Magdalena, protected from big waves, very calm. Playa Segunda de El Sardinero, Playa de Castaneda. Somo Beach is a little bit outside of Santander. It can be reached from downtown Santander by boat. Boats leave every 10 minutes and the boat ride takes about 10 minutes. 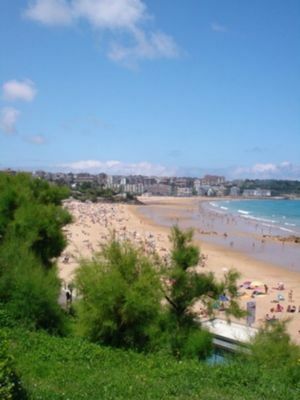 Somo Beach is about 3 km long and is less crowded than beaches in Santander. The Universidad Internacional Menéndez Pelayo  offers summer courses for university students, including Spanish language courses for foreigners, that take place both at the Magdalena Palace and at Residencia Las Llamas. The Universidad de Cantabria  offers Spanish language courses of 4 to 10 weeks duration throughout the year through the Centro de Idiomas (CIUC). CIUC also coordinates exchange students at the university. The best area to eat fish is the district close to fishing harbour (Barrio Pesquero), although locals usually regard this as a tourist trap. Santander is known amongst Spaniards for its many Regma ice-creamery outlets. At times it can seem that they have an outlet on every corner. Their very generous serving sizes of 8 popular flavours of ice cream have been melting down the hands of locals for years, even throughout the winter months. Other chains such as Capri on Paseo de Pereda provide a greater range of choices. Bodega Javi Quintanilla, Guardar Calle Bonifaz, 9, offers various email. Very nice atmosphere. Bocardes rebozados, 2 glasses of vino rosado, tacos de merluza fresca a la romana con pimientos verdes cost 21 Euro (September 2013). Bus stop PUERTO CHICO. Bodegas Mazón, Calle Hernán Cortés, 57, offers various meal. Very nice atmosphere. Crowded, best before 8 pm to go. Chipirones encebollados, Queso menchago, Tinti de Toro (cosechero) - red wine, 2 glasses of vino rosado (rosé wine), bread, queso tomate cost 22,50 Euro (September 2013). Strong recommendation. Bus stop PUERTO CHICO. La Bogeda (across Hotel Santemar, Calle Joaquin Costa, close to Plaza De Italia), small local place. Pintxos and tapas. Anchoas, albondigas, 2 bread, mixed salad, 3 glasses rose wine cost 26,80 Euro (September 2013). Tv and football matches can be watched. Señores Patatas on Calle Santa Lucía offers student-priced meals of fries and hamburgers. Try the 'Five Sauces' (Cinco Salsas) plates with five types of fry cut and five types of sauce. Taj Mahal on Calle Santa Lucía is the only Indian restaurant in town and serves a tasty alternative to the Spanish staples. Sakura near Cuatro Caminos serves Japanese dishes. In the summer, everybody starts their night at Plaza de Cañadío, in the centre of the old town. It is a hive for young Santanderinos and exchange students. It is surrounded on three sides by various bars and restaurants. During the school year, Rio de la Pila becomes the new Cañadio. It is cheapest if you buy your alcohol of choice from the grocery store beforehand. These locations are where most drinking of calimocho - the red wine/coca-cola combo favoured by young Spaniards - takes place. Later in the night (from about 2AM) the drinking action moves to bars and clubs in the area, including La Embajada, Retros, Cafe del Sol, La Rana Verde, Opium and many others. Three major dance clubs are located nearby - Malaspina, El Divino and Rocaverde. NH Ciudad de Santander, Menéndez Pelayo, 13-15, +34.94.2319900 . There is one other NH Hotel in Santander . Santoña: recommended by local people, where fish food must be very good (September 2013). ALSA buses on the way from Bilbao to Santander do not stop here, probably easiest way is to rent a car and go there. Castro-Urdiales: seaside village east of Santander with a nice Gothic church and lighthouse. Laredo (Spain): another seaside village to the East, the old quarter is worth a visit. Potes: this small village is the key to the Picos de Europa mountain range (which is a National Park), and the Liébana region. Good eating place, and the local orujo (a strong spirits drink) is highly recommended. Reinosa: the main town on southern Cantabria, it's a good base to explore the Cantabrian mountain range (Cordillera Cantábrica), with the Alto Campoo sky resort, the Roman city of Julióbriga and several Medieval churches close by. Santillana del Mar: Picturesque stone village 1 hour away by bus; visit the famous cave of Altamira. San Vicente de la Barquera - Sea-side fishing village, about 30 minutes by bus. See the fishing vessels unload what Madrid will be eating tomorrow. Fantastic tides, so stay for at least 6 hours. Nice Roman bridge. Valles Pasiegos: for a taste of rural Cantabria, no better place than the Valley of the Pas river, especially Toranzo, Selaya, Villacarriedo, Vega de Pas, San Roque de Riomiera and San Pedro del Romeral. Try the typical sobaos and quesadas, two traditional desserts.